Finding an all-in-one SEO research tool that is affordable has been near impossible, most of the major SEO tools like Ahrefs, MOZ and SEMrush start around $70 pm. I had given up finding a decent SEO tool at an affordable price until I came across Serpstat. In this review of Serpstat, you will see how it stacks up against the big players, why it is one of the best SEO tools on the market and how it can help find easy to rank keywords and grow your traffic. The SEO research tool marketplace has been dominated by 2 or 3 big players for the past decade or so. Ahrefs, SEMrush, Majestic and Moz are the four large organizations that have shaped the SEO tool landscape. However, as I said, most of these tools are beyond the means of most new bloggers and online entrepreneurs. Most of us will be on a tight budget and cannot afford the huge monthly fees that these tools charge. 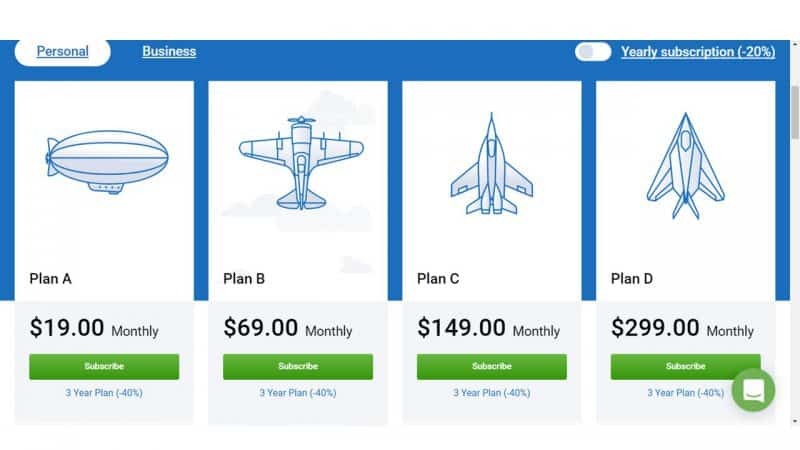 However, Serpstat is different, not only is it as powerful and feature-rich as the tools I mentioned but Serpstat comes with pricing plans that are tailored for everyone. Today I am going to take an in-depth look into what Serpstat does right (and what it does wrong) and show you exactly why this SEO tool is becoming more and more popular. Serpstat was released around 2013 and was initially a reasonably basic keyword research tool. It had some positive reviews and enjoyed some mild success, but even back then it was already being dwarfed by the size of SEMrush (Ahrefs wasn’t providing keyword data in those days). There was nothing wrong with their product, in fact, it was pretty good. But they just didn’t have access to the huge amount of computing power required to get a level of detail and insight comparable to SEMrush and Majestic. So, as you can see, in a little over 5 years, this SEO tool has grown exponentially and their keyword database is in league with the likes of SEMRUSH, MOZ and Ahrefs. Due to this Serpstat can boast of over 30,000 clients who rely on their services on a daily basis. There is a lot of reasons for its popularity, one of them is their multiple paid subscription packages, you have a total of 8 to choose from and the lowest starts at $19. SEMrush only has 3 and its lowest package starts at a whopping $99.95!! Plus, Serpstat has a free version you that allows you to use their tools on a limited basis. Serpstat can be broken down into 5 different sections. They are all inextricably linked with one another and navigation between them is as intuitive as you would expect from a serious SEO software company. Let’s take a look at each of these modules in a little more detail to see what you can expect from the platform. 1.Domain analysis – This tool will analyse any domain name you enter into the search bar and provide data for all organic and advertising keywords associated with the domain. It will give you data into its competitors organic and paid keywords as well as all the domains top ranking pages along with their keywords. 2.URL analysis – Pretty much the same as domain analysis except that this will analyse URLs and provide data for any keywords paid or organic that is associated with that page. It also lists competing pages and shows what keywords they are ranking for and Serpstat will also provide any keywords that one URL is ranking for but not the other. This is a great way to find new keywords to rank for. 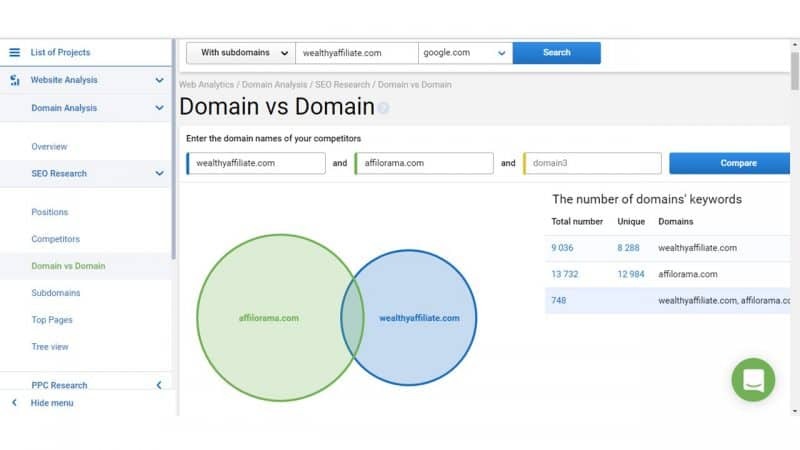 Both these tools also let you compare domains and URL’s side by side and analyse to see how many keywords each are ranking for and whether any 2 or 3 domains and URL’s are ranking for the same keywords. 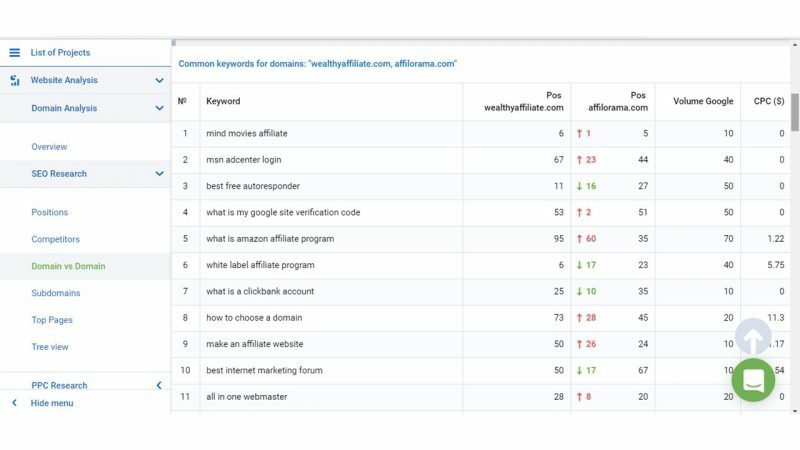 As you can see from the image below, I compared the domains of Wealthy Affiliate and Affilorama and it gave me all the keywords that these two competing companies are ranking plus how many of these keywords are common to both. Keyword research was what started it all for Serpstat, it was their only offering when they launched back in 2013. When I first reviewed Serpstat, their keyword research feature was the weak point, however, they have improved it over the past year and now it is one of my go-to keyword research tools. The other keyword tools I use are Jaaxy and KWFinder and along with Serpstat, they are, in my opinion, the best value for money keyword research tools. Trust me, if you are a solopreneur, you do not need to waste money on tools like Ahrefs, SEMRUSH or MOZ when you will never use half the features they come with. SEO and PPC – Serpstat provides you with a wide range of obvious (and not so obvious) keyword suggestions suitable for both PPC and SEO campaigns. Also provides SEO and PPC keywords of your competitors. Competitor Keyword Analysis – This is one of the most powerful competitor analytics tools available anywhere. This uses Serpstat’s keyword research tool to find out what your competitors are ranking for. This usually provides you with what we call in the SEO world as ‘low hanging fruits’ keywords with weak competition ready to be taken advantage of. 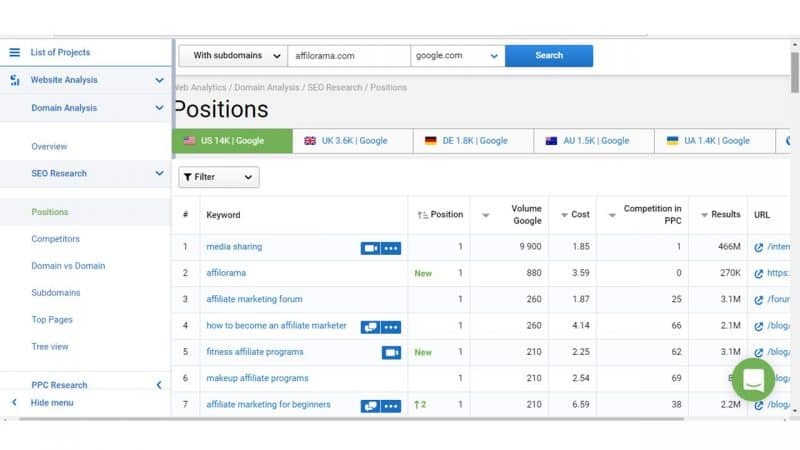 This is one of my favourite tools in this software,I looked up what keywords Affilorama was ranking for and I found some that I know I can get to the first page of Google because of their weak keyword difficulty score. Search Suggestions – Serpstat has a sizeable database of Google’s search suggestions which are often goldmines for content marketing ideas. Type in a domain or keyword and get a long list of potential ideas ready for development. Related Keywords Database – Make your content marketing work smarter and harder for you. The related keywords database can find multiple keywords relevant to your content that can bring you in extra traffic for no extra effort. Social Metrics – With this handy tool you’ll be able to instantly see how much social traction your content is getting (and you’ll be able to compare it to your competitors). This allows you to get inspiration and see what they are doing that’s working. Content Marketing – This feature will help you generate ideas for content. You can dig deep into this analysis tool and find out what your audience is asking and looking for and then give it to them. The hardest part of content marketing is making a decision on what you should write about and whether it will get any traffic. It can often feel like a shot in the dark much of the time, so a little bit of guidance is always a fine thing. Serpstat’s suite of content marketing ideas tools makes your content marketing decisions justifiable based upon real-world data. SERP analysis – Query any keyword and analyse the search engine results and see the data that is driving websites to the first page of Google and other search engines. Backlink analysis is the biggest barrier to entry for anyone hoping to compete with the big SEO tools. As you probably already know, a good backlink analysis tool needs to scrape the entire web (regularly) to be of any use to anyone. This is an extremely resource intensive process which is where many new competitors fail. However, Serpstat has clearly thrown insane amounts of money at this section of their site because they are a serious competitor to the big 3. Their fresh backlink database is of a similar size to Ahrefs and Majestic (possibly a little smaller), but this makes it much bigger and better than SEMrush’s database. Backlink dashboard – With a single click, you’re going to be given a full breakdown of all the links pointing to a page (or a domain) alongside anchor text ratios and referring domain counts. Quality Scores – Knowing how many backlinks a site or a page has is only half the battle, you also need to know how powerful (and trustworthy) the sites are to conduct a proper analysis. 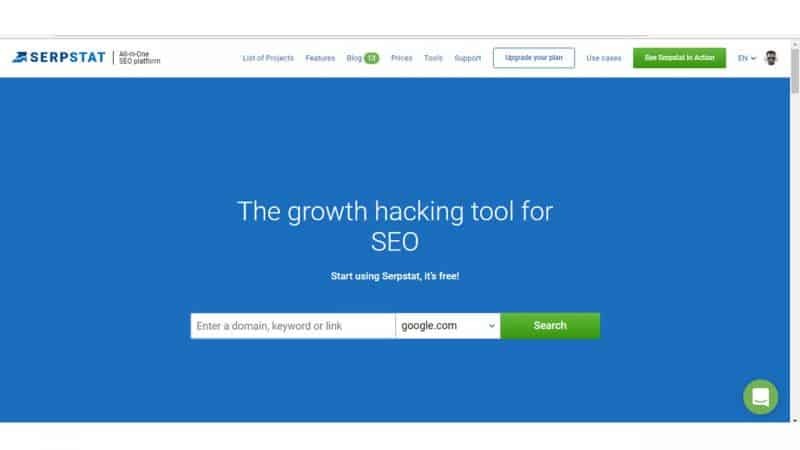 Serpstat’s quality score is an easy way to get an instant indication of the domain and page quality (without having to go digging through the backlinks individually). Serpstat Page rank – A score of between 0-100 is given based on the quality of backlinks that are referring back to the domain being researched. Serpstat trust rank – A score between 0-100 is given based on how trustworthy the backlinks are. Top Pages – Here you can enter a domain and find out all the top pages that have recently acquired a backlink. This is good for competitor analysis as you can see where your competitors are getting their backlinks from and which to which page and reverse engineer the process to acquire one yourself. 90 Days Of Data – All backlink information that has been collected is fresh and 90 days old at most. This means you’re getting the latest and most accurate information possible and you can rely on the fact that all the links shown are probably still live. Batch Analysis – Insert a list of your competitor’s domains in this tool to identify patterns between them. Find out if they are all doing something you’re not, and discover domains that link to several of them for potential link building opportunities. Serpstat’s PPC analysis is one of the best in the business thanks to their huge database of ad placements (over 180 million ads and counting). They provide a wide range of tools that allow you to identify opportunities and stalk your competitors. Competitor Identification – Discover who your main competitors are and find out the full range of keywords they are targeting. 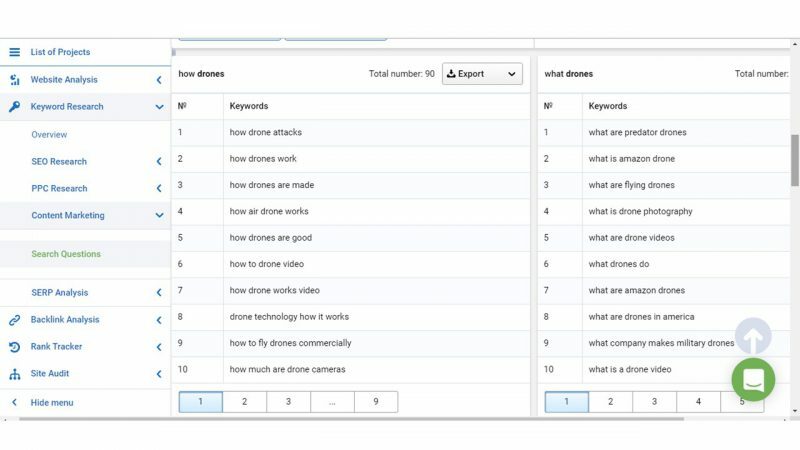 A few clicks on this module often leads to the discovery of at least a handful of keywords you’re not targeting (that you probably should be). Competitor Strategy / Budget – With this module, you’ll be able to figure out how deep your competitor’s pockets are and get an idea of their overall strategy. This allows you to easily outflank them and stay one step ahead at all times. Again the tools we are mentioning in this section are listed as separate features on Serpstat’s website but we feel they should be lumped together here. They work hand in hand with the larger modules above to create an all in one platform that basically covers all of your digital marketing needs. Rank Tracking – Serpstat has an incredibly accurate and fully featured rank tracker that is included in their platform. You can check the rank of your website,your competitors website or a client website (if you run an SEO agency) for any given keywords within a certain number of search engines. On Page Audit – This tool will analyze your sites on page SEO to determine any areas of weakness that could be holding your site back in the SERPs. The entire audit is automated and presents the results in an easy to understand report with recommendations of what to change and how to do it. Market Intelligence – Identify influencers that are dominating rankings in your niche and track their progress. Be alerted to trends that they are working on and get notified if you’re catching up to them (or falling further behind). When it comes to Serpstat vs SEMrush I’d choose Serpstat hands down each and every time. It provides much of the same information and a very good backlink analysis tool, for a cheaper price. Perhaps if you’re a pure PPC guy I could see why SEMrush could be a better option. But if you are on a tight budget and just started this whole SEO thing, Serpstat is a clear winner. Just look at the number of backlinks it has in its database compared to its competitors and remember that backlink analysis is a relatively new feature that Serpstat has rolled out. You can use Serpstat for free with limited features, still, even with its limitations, you will see the potential of this brilliant SEO tool. Serpstat’s entry-level package (which is fully featured) comes in at $19 per month. And I confidently say that this is a genius move. One of the biggest problems with the major SEO tool is that they don’t offer entry-level packages. For occasional users paying the minimum of around $60 per month (for any of the major tools) seems a little bit excessive. Serpstat allows you to pay for only what you use. Their entry level packages are slightly restrictive in the amount of search queries you can make (300 a day). However, this is more than enough for the individual marketer.To be totally honest, if you need more than 300 queries per day you’re probably making enough money to pay for the next package up anyway ($69 per month). Serpstat has something for everyone from the sole individual marketer to small to medium-sized companies, their wide range of subscription packages will meet the demands for everyone. If you are looking for an affordable all in one SEO tool, look no further than Serpstat. Serpstat is a great platform that is going from strength to strength. I am sure that they are on the radar of the major SEO software mentioned in this review. Making this much progress in just 5 years is good for competition and may even lead to its competitors lowering their prices. Try the Serpstat free trial and get full access to all their platforms features for a limited time and see for yourself just how powerful it is. I am pretty sure you’ll be glad you did.